I am heading across the Pennines for my first trip to Manchester Print Fair at Manchester Cathedral, which just looks the most amazing venue. Shopping from local makers, special creative workshops and more. After a break for the last couple of years I am back at the lovely Ilkley Art Trail. This year there will be around 60 artists exhibiting over 3 days with some new venues at this new time of year. My very first time at Horsforth Art Walk, a completely free event which is community led and celebrates all things creative. You will meet artists and makers in all stages of their career and lots of creative residents and community groups joining together for a fun filled weekend. The first Armley Print Fest and this much be my most local print fair to date whilst living in Leeds. It’s taking place in the wonderful Leeds Industrial Museum at Armley Mills where canals have a look round the museums which includes a beautiful vintage Albion press amongst other wonderful exhibits. It's that time of year again, where I start thinking about my annual studio clear out! For those who have not taken part before this is an opportunity to pick up some reduced framed pieces, as I clear out some older stock, I will also be clearing out some old card designs and it could be the last chance to pick up some of my prints too. 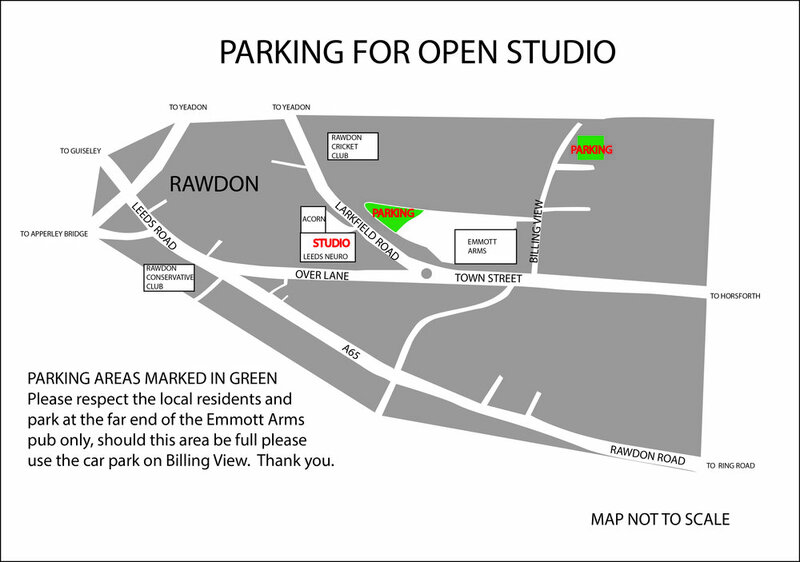 I will be having an Open Studio in Rawdon on the Saturday and Sunday so this year I will do all posts on the Sunday, from 6pm. This will run as previous years, so items will be posted on this event throughout the evening and the first person to say SOLD gets the item! There may be more than one and also sometimes people comment but do not buy so always check the picture. After you have made your purchases please sent me a direct message to arrange payment and the postage or collection of your item(s). There will also be a sale on my website. After a year off I’ll be back at Leeds Print Fair which is now being held at the Grade 1 listed Holy Trinity Chruch, right next to the Trinity Centre on Boar Lane. “There will be thirty stalls displaying a huge variety of original handmade work by printmakers and artists from around Yorkshire and further afield. Returning to the UK’s leading festivals of visual arts, this year there will be over 100 galleries and artists from across the UK with over 3,000 original artworks for sale alongside a host of exclusive events at the fair and across the city. From very high end of the spectrum to me and my screen prints. We will be at the wonderful venue of Manchester Central which is easily accessible on public transport as well as having an onsite car parking. This year instead of the usual Ilkley Art Trail this year there will be a smaller but lovely weekend of events at Nell Bank. There will be over 20 artists selling work there including myself, as well as lots of family activities, refreshments and an Insect Sculpture Walk. I'll be back at this is a wonderfully different even where each year, artists transform cattle pens into galleries from which they sell original works of art of all different styles and mediums, including new and established artists. Skipton Auction Mart is a functioning cattle mart there is an on site cafe will provide hot and cold meals and drinks. I will be there talking about my work and my process at an evening event held on the 18th May starting at 7pm. Always glad to be back in at my home town event, and one of my favourites, Saltaire Arts Trail. I love being part of the open houses and have been a visitor to them long before it was my ambition to be part of them. Myself and Anna Tosney are being hosted at the house of crochet artist Lola of Aupalola at 16 Titus Street, a wonderful space that always receives so many compliments. Trail Guides are available for a donation of £1 to help this wonderful event keep going. I will be exhibiting at this wonderful location again, this time in their annual printmakers exhibition, along with some wonderful artists. A wonderful location inside the grounds of Harlow Carr at The Old Bath house, go and explore, have a treat at Betty's Tea Rooms and see some some wonderful prints. Please note that Just Makers is located at the bottom of the gardens and normal garden admission prices are charged in order to visit. As you may already be aware the previous date of this fair was cancelled due to the Beast from the East. Luckily they have rescheduled, I won't be there in person (so much for me timing my trip around the fair) but my lovely mum Maggie will be there looking after things for me. Even though I will be absent it'll be my first event of the year, there will be over 50 printmakers, collectives and galleries that have been handpicked from around the country, plus talks, workshops and more. Families can enjoy free printmaking activities across the weekend. In addition to The Hepworth Café, a street food market will offer food, drink and covered seating for visitors. This is the first Christmas Market by this great venue in a wonderful historic mill complex in Farsley. There will be over 50 regional artists and makers showcasing original work; designed and made by hand. Including jewellery designers, fine and mixed media artists, ceramicists, textile and paper based products together with gifts, glass makers, vintage furniture, cards and prints. It sounds like the perfect way to get ready for Christmas with mulled wine, mince pies, carol singing choirs and Christmas cake at the pop up Arctic Café. Every year so far that I have been selling my prints I seem to have missed this lovely fair in the centre of one of my favourite places. The Yorkshire CND fundraiser is back this year at the beautiful Victoria Hall. There will be a huge range of stalls over 3 rooms showcasing beautiful handmade gifts, crafts, pottery and more. There will also be delicious vegetarian food, live music, raffles, complementary therapies and a Santa’s grotto. A really great way to start this year's run of Christmas events, I can't wait! From the people who brought you Northern Craft, this is the first Northern Print Fair. Located just out the centre of the city in the fantastic Duke Studios, which is just down the road from The Tetley, this should be a wonderful event! Sheffield Print Fair is now into it's 5th year, and at this event they're having 42 printmakers selling their work. Plus print demonstrations, including a kids printing workshop. All profits go towards St Mary's charity for homeless people and refugees. "The skills of master printmakers are explored in this beautiful group exhibition of etchings, mezzotints, linoprints, screenprints, collagraphs, drypoints and woodcuts by some of the most celebrated printmaker’s of our time. Featuring 16 printmakers; some established and who we’ve had the pleasure of working with for the past 35 years and those that we've recently discovered." For information about the artist s taking part, plus some lovely quotes about their experience with working with the gallery visit the website here. Now in it's 10th year Buy Art is recognised as one of the UK’s leading festivals of visual arts, this year there will be over 100 galleries and artists from across the UK with over 3,000 original artworks for sale alongside a host of exclusive events at the fair and across the city. This year the event will be at Manchester Central which is easily accessible on public transport as well as having an onsite car parking. If you think you might be interested in coming to the VIP evening on the Friday please let me know as I have an allocation of tickets, or purchase a ticket on the above link for £12. I have been in my studio over a year and I haven't even done an Open Studio day yet, so I thought it was about time I got myself sorted! My studio is now based in Rawdon and if anyone came to see my Shipley space this is a little different. Here I have all my own screen printing workshop, so I can show you my process on the actual equipment I use in the my own studio. Leeds Neurophysiotherapist themselves work with people with MS, Parkinsons and who have suffered from strokes. Ben Holden (bjthebear.com), a designer from Bradford with a passion for print purchased a Riso machine in April 2017. He has invited friends to help him explore the creative possibilities of this once-obsolete technology. Many will be producing Riso prints for the first time and have been invited to take Bradford’s buildings and landscape as starting points for their experiments. All prints for sale with over 50 artists taking part, and includes my Shipley Clocktower.